This course is designed to instruct the technician on the description and operation of the diesel engines found on Ford, GM and Dodge trucks. The diesel engines which are covered in this course are the Dodge Cummins 5.9L CR and the 6.7L, the GM Duramax 6.6L and the Ford Powerstroke 6.0L and the 6.4L. Emphasis will be placed on the use of service information, the scan tool and programming procedures. The use of the Select Catalyst Reduction (SCR) on newer trucks brings a need to discuss and instruct on its operation and repair. Emphasis will be placed on instructing the technician to follow a diagnostic strategy. 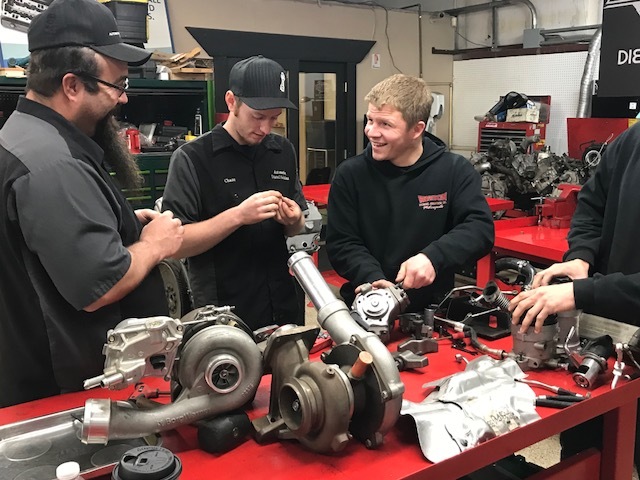 Course Objective: Given the training, service information and tools, the technician will repair and diagnose Powerstroke, Duramax and Dodge Cummins diesel drivability complaints. Information provided will aid the technician in the ability to follow a diagnostic strategy. The five day course will start with discussion on networks. Have scan tool communication issues? In this portion of the training, we will discuss CAN network and identifying the 16 pin OBD II connector and PIN checks. Wiring diagrams are analyzed and testing is performed on vehicles. The Powerstroke 6.0L will be introduced and comparisons from the older 7.3L will be discussed. This section of the course will include teardown and demonstrations. G2 Injector operation, what is stiction? Fuel pressure and aeration checks. High pressure oil system, the plumbing, isolating leaks, diagnosing. The fuel injection module (FICM), programming and diagnostics using the scan tool and IDS. Engine design, heads, head gasket issues, diagnosing, engine lower end components. Turbocharger, how the variable vane turbocharger functions, design and teardown. Diagnosis and repair. Role play diagnostic techniques and review case studies. We will continue discussion on the piezoelectric common rail fuel injection. This common rail system was introduced on the Powerstroke 6.4L. Instruction will cover the components and tests to perform with the scan tool and tools recommended. Sequential Turbocharging system. Discuss the differences between the low pressure and the high pressure variable vane turbochargers. Tests and diagnosis will be covered. After treatment Systems 101. This portion of the course will cover the emission reduction that takes place in the Diesel Oxidation Catalyst (DOC) and the Diesel Particulate Filter (DPF).There will be extensive discussion on regeneration issues. The instructor will cover the operation of the exhaust temperature sensors and the pressure differential sensor. Diagnostic strategies will be viewed. Engine design and repair. We will have an engine on hand to tear down and review all the components. Electronic Controls- APP, ECT, and various pressure sensors will be discussed and their diagnostics will be shown using the multimeter and the IDS scan tool. Key on engine off (KOEO) and key on engine running tests (KOER) will be performed on a live vehicle. We will move on to the Duramax 6.6L engines. There are several versions of the Duramax starting with the LB7 and the following are LLY, LBZ, LMM and an overview of the newer LGH and the LML. Which are the Duramax engines? LB7, LLY, LBZ, LMM, LGL and LML. Common rail fuel injection system used, components and diagnosing. Engine design and differences, key items to know when repairing this engine, disassembly *procedures, checks and assembly. Review key components. Cooling system issues. Instructor will demonstrate common mistakes technicians make with the cooling system, proper repair and filling. Turbocharger operation- Early wastegate Borg-Warner to the variable nozzle Garrett style will be explained and we will review common diagnostic checks. Programming and the use of service.gm.com. Confirming the latest updates and learn how to program using the scan tool. Service information review. Know how to use the service information from GM and other service information providers. Diagnose diagnostic trouble codes properly. Network diagnosis, review the CAN system and the GMLAN how they are set-up. Instruct common procedures to follow when diagnosing these diesel engines. Review use of Tech 2 and Tech 2WIN scan tools. Discuss aftermarket scan tools such as the Snap On Verus. The last portion of the course will cover the Dodge Cummins 5.9L and the 6.7L Common rail engines. The Dodge ram equipped with common rail injection on both the 5.9L and the 6.7L have brought issues to technicians. Technical information and procedures are available in this course. The 5.9L with CR(common rail) was introduced in 2003. The use of a high pressure fuel system is diagnosed by system to make an accurate assessment on what failed. The low pressure, and return system are checked and procedures are explained. The Cummins 6.7L is also instructed along with additional emission controls and electronics. Turbocharger diagnosing, identifying the 5.9L vs 6.7L .Compare the wastgate Holset with the variable nozzle found on the 6.7L. 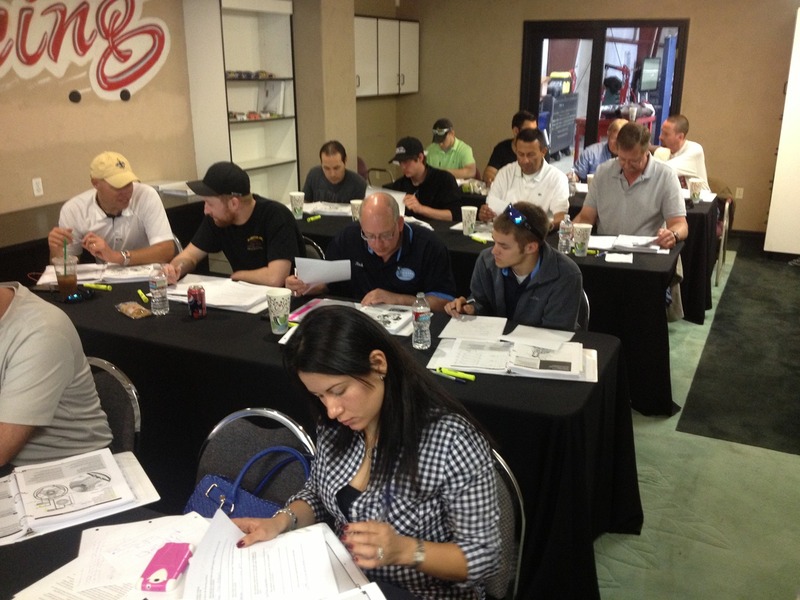 Instruct on procedures to check boost and turbo actuator testing. Discuss common issues found with both systems. Cummins 5.9L wiring inspection and PIN checking at the ECM connector are demonstrated. EGR system on the 6.7L is viewed. This includes the issues such as carbon sticking and use of scan tool data are taught and demonstrated. After treatment system , the diesel oxidation catalyst (DOC) and the diesel particulate filter operation and regeneration strategies will be instructed. Cooling system refill procedures and tests to perform when coolant consumption is an issue. How to program and ensure a correct diagnosis for ECM replacement. Review Injector wiring and tests to perform when a short or open diagnostic trouble code is set. How to retrieve SKIM codes and explain the role they play when you program an ECM. Tools and scan tools will be on hand to use on vehicles and engines. You are welcome to bring your scan tool should you have any questions. The course will have technicians using the service information and completing worksheets and discussions which will cover various case studies that will aid in refining the diagnostic process. This fee includes all materials, continental breakfast and lunch for all five (5) days of training, Dinner is on your own. Hotel is not included. Click Here For Hotel Recommendations.